Slatwall panels are the perfect solution for increasing your desk surface area and making the most out of workspace real estate. 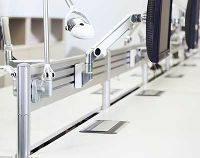 Access Rail, Humanscale's own slatwall solution, can attached to any table and is infinitely configured in a variety of lengths. The Access Rail offers the ideal mounting solution for all your ergo tools and accessories.